What’s the first thing you picture when you hear “family room”? Many of us imagine the entertainment center, comfortable sofas and chairs, and quality time with family and friends. But have you ever thought about how compatible your floors are with your family’s lifestyle? The flooring in your family room can have a huge impact on your family’s overall comfort and quality of life. 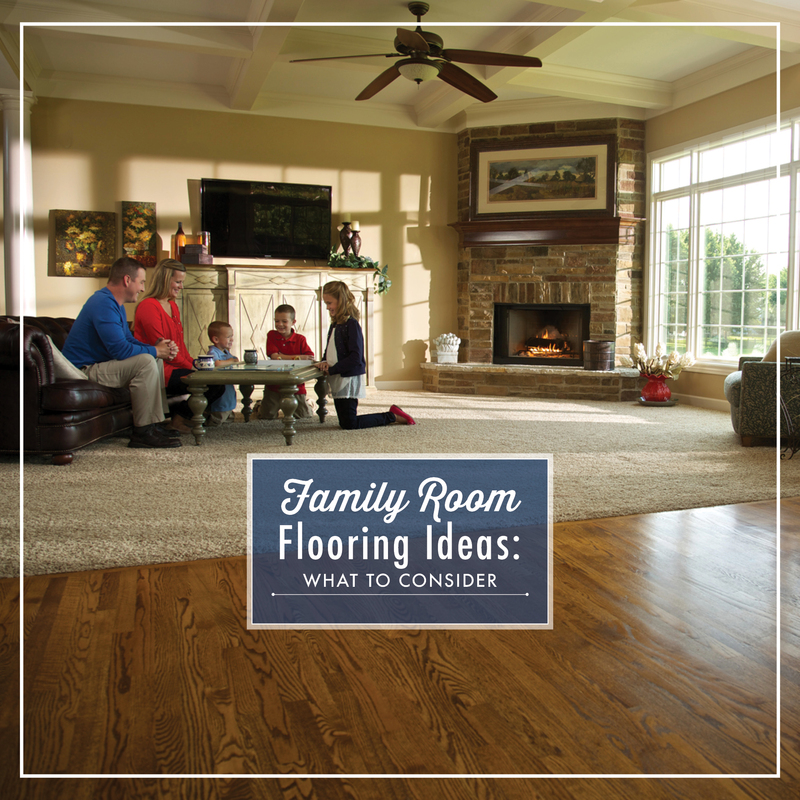 Here are some things you should consider when choosing family room flooring ideas to help make sure you and your loved ones have the right flooring for everyday life. The first thing you should consider is your family’s lifestyle. How many children do you have and how young are they? Do you have any pets? These factors can determine what type of flooring you should get and what will be beneficial for your family. Young children like to play on the floor, so something soft and comfy would be ideal for them. Carpet is an easy choice due to its soft comfort and beautiful aesthetic. There are many different types of Carpet to choose from. Plush and frieze are a great starting point if coziness is priority number one. Berber Carpet may not be as soft as plush or frieze, but it can be easier to clean and less likely to shed fuzz. Berber’s looped fibers can even help prevent spills from leaving bothersome stains. In general, Berber is a great choice for active family rooms where function is prioritized over style. Pattern Carpet pairs unique styles with high durability. If you’re looking for a great contemporary look without the hassles of daily maintenance, pattern Carpet would make an excellent addition to your existing family room decor. Although these carpet choices are great for kids, Berber and pattern aren’t good for pets. Because they have looped fibers, claws can get caught easily. This can easily result in snags, making the carpet look messy and uneven. Getting flooring to fit your family’s lifestyle is important. However, you also want to make sure the look fits your taste and the rest of your home’s décor. Wood looks can be achieved without using Hardwood. Instead, people are exploring options like Luxury Vinyl Plank(LVP) and Laminate. Laminate’s surface is scratch-resistant, durable, and can resist stains. It is also less likely to experience color fading due to sunlight, so feel free to open your blinds wide. With Laminate, you get a wood look for a lower price with the durability needed to handle your family’s lifestyle. If you’re expecting to host guests or spend most of your days in the family room, you should opt for flooring that has the durability to handle the heavy traffic. Family can be messy and spills are inevitable, so it’s also important that your family room flooring can withstand the occasional “uh-ohs”. Many vinyl flooring products from Empire have slip, stain, mildew, and scratch resistance, making it a durable option for a busy household. LVP gives you a wood look with cost-efficient durability. This means you don’t have to worry about scratching wood floors. Vinyl also comes in a stone look, helping you give the room a bold and sophisticated style without worrying about damaging your flooring. Think about how much time you spend in the family room and you’ll realize how important it is to choose the right flooring for your family’s lifestyle. Whether it’s Carpet, Hardwood, Laminate, Vinyl, or Tile, you can discuss family room flooring ideas with an experienced Flooring Professional. Schedule your FREE In-Home Estimate today to see how easy it is to get beautiful new family room flooring.